Hayek ‘rectified’ his own past: Spann, who aspired to be the Nazi’s sole intellectual Führer, must have been the major influence on the undergraduate Hayek. 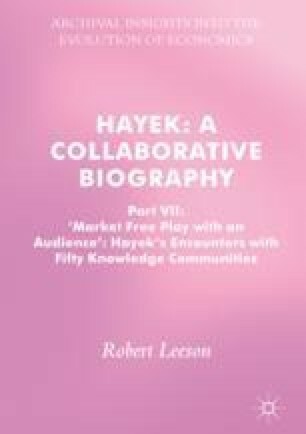 Hayek’s ‘spontaneous’ order collapses upon inspection; and his promotion of ‘an “un-understood” moral tradition’ corresponds with Margaret Thatcher’s concern: ‘what can be done with a people who are their own masters if they are not submissive to the Deity?’ According to Hayek, ‘You might call every belief in moral principles, which are not rationally justified, a religious belief. In the wide sense, yes, one has to be religious. Whether it really needs to be associated with a belief in supernatural spiritual forces, I am not sure…It’s by no means impossible that to the great majority of people nothing short of such a belief will do.’ His ‘cultural heritage’ survived so long as it was ‘not articulated in words’ and ‘not discussed or consciously examined’—sentiments shared by the John Birch Society.